Set out needle tools or ten-penny nails, containers of slip or water, and clay. Have available the pictures of animals for discussion. 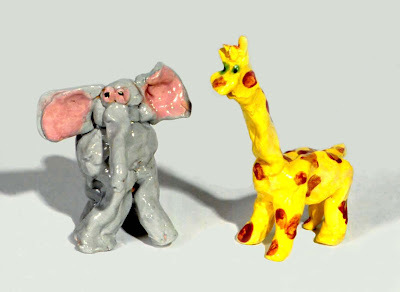 In this session the children will be using clay to make animals that are three-dimensional or viewable from all sides. 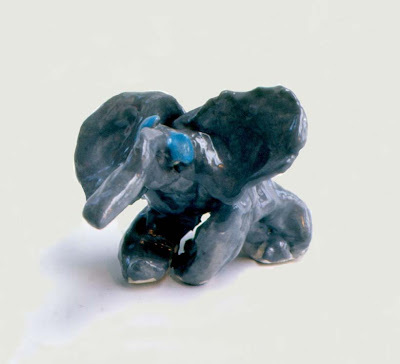 Be sure that the children understand that it will take several weeks to complete this project since the clay must be dried slowly and fired in the kiln. While showing the pictures of the animals to the children, discuss the unique characteristics that help to identify each one, such as an elephant’s trunk, an alligator’s mouth, and a tiger’s stripes. Explain that animals with sturdy legs and appendages are better suited for making with clay. 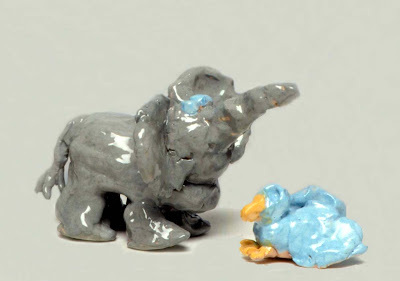 Most young children approach clay by flattening it out. To help them understand the concept of three-dimensional forms, I break off a lump of clay and set it on the table. Next I break off four smaller pieces for the legs. Leaving the lump on the table, I attach two legs on each side of it. Then I say, "Now my animal can go for a walk." With giggles and protests, the children argue, "No, no! He's lying on his stomach. He can't walk." I put the legs on top of the lump. They respond, "No, no! He still can't walk. He's on his back." I then lift the lump of clay up from the table and attach the legs underneath. They agree, "Now my animal can walk." Show the children how to attach pieces of clay using the scratch-and-slip method by scratching the surfaces to be joined, applying a small amount of slip or water, and pressing the two pieces together. 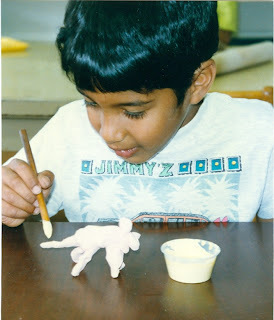 With the animals in standing positions, it is easier to continue building them, but be sure the children understand that the clay is soft and they should press gently when they make additions. 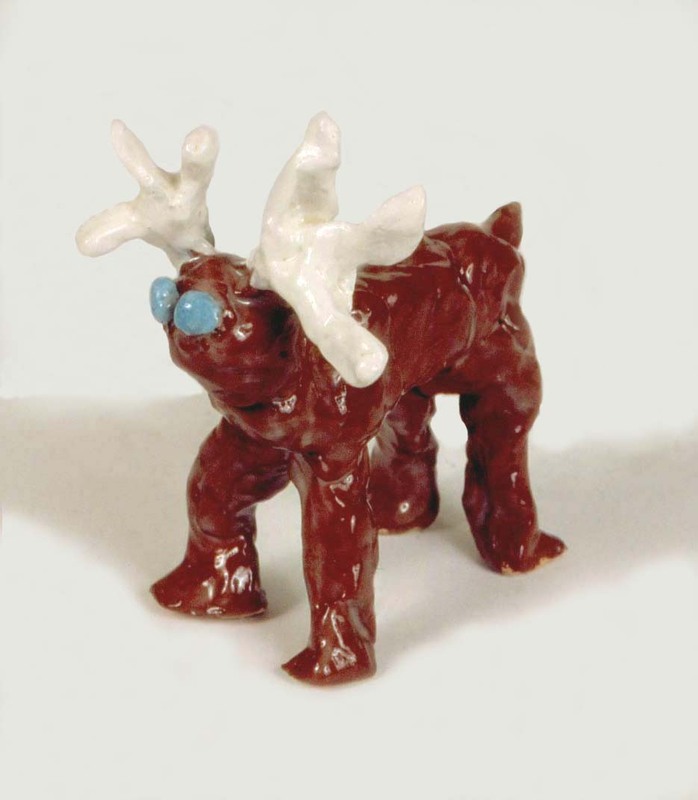 Have the children create their animals, encouraging them to lift the clay from the table and turn the animals as they work so they will be three-dimensional. Note: Make an air-release hole in the bottom of any piece which is more than 1½ inches thick. Dry the animals very slowly under plastic wrap, loosening the wrap gradually. When completely dry, bisque fire the clay pieces in a kiln. Tell the children that since the clay pieces have been fired in a kiln, they are now referred to as bisque-ware and are very fragile. Emphasize that they must be handled carefully. Explain to the children that they will be applying underglazes, which are paints for clay, to their animals. Demonstrate how quickly the underglazes dry when applied to the bisque-ware. The children need to dip their brushes often to avoid scrubbing and to cover all areas. They should gently dab into any cracks or rough areas on the clay surface. 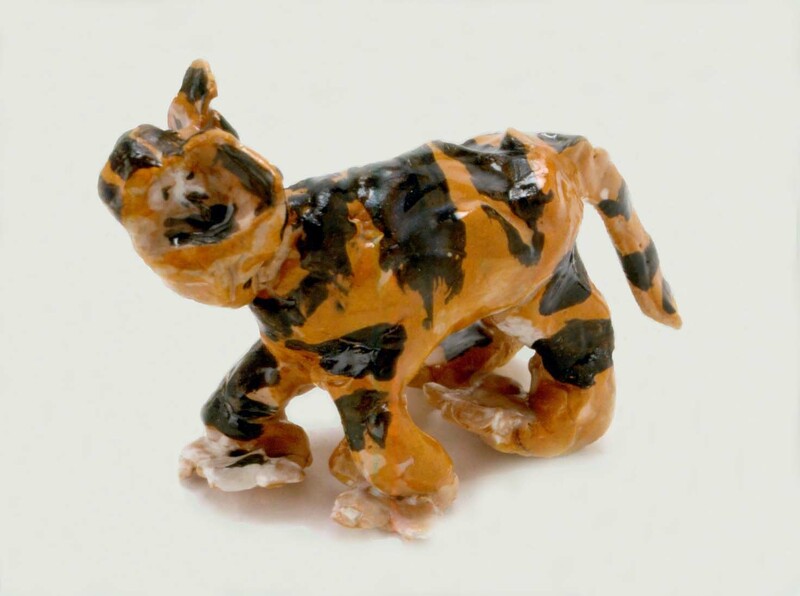 Show the children that they can apply designs, such as tiger’s stripes, directly on top of the dried underglazes. Explain that the last color painted is the one that will show. 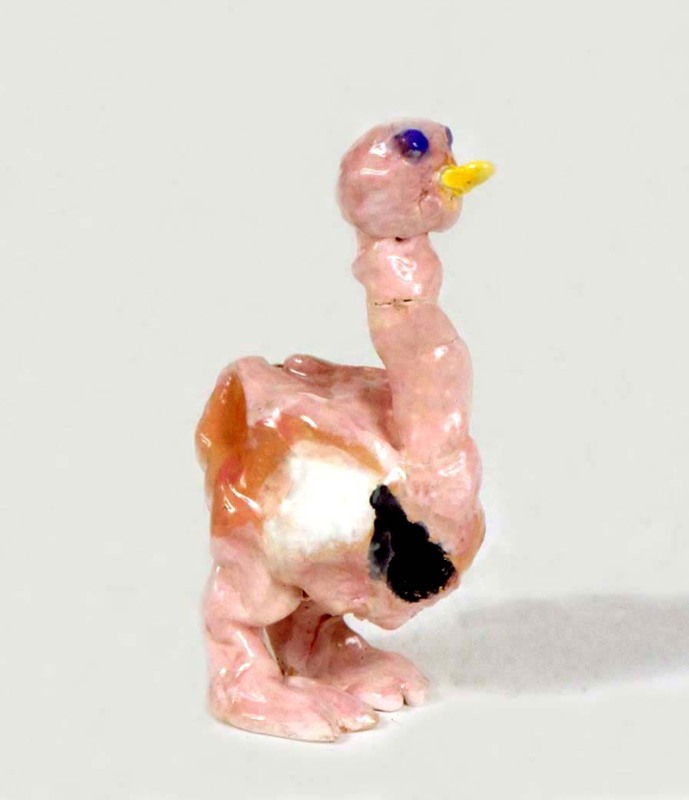 Have the children paint their animals with underglazes, reminding them to handle the bisque-ware very carefully. Note: Let the animals dry overnight before applying a coat of clear glaze. This is best done by an adult because any glaze on the bottom of the clay will cause it to stick to the kiln shelf in the glaze-firing. This would also eliminate the need for a third session. If you choose to have the six- to nine-year-old children apply the glaze themselves, it is best to re-fire the underglazed pieces first. Set out re-fired underglazed animals. Explain to the children that they will be applying glaze to their animals to make them shinier and stronger. Tell them that the clear glaze will cover up the underglaze colors temporarily. When the clay is fired in the kiln again, the glaze will melt and turn clear, allowing the colors to show through. Show the children how the clear glaze looks transparent when it is first applied and still wet, but dries very quickly and becomes opaque. The number of coats needed varies according to the glaze instructions, but usually one or two coats are sufficient. Warn the children to avoid getting glaze on the bottom of the animals’ feet because it will stick to the kiln shelf during firing. If any glaze does get on the bottom, wipe it off with a damp cloth before firing in the kiln. Have the children apply the glaze to their animals, reminding them that the clay is very fragile and should be handled as little as possible. A trip to the zoo will create excitement for the project and add vitality to the clay animals. When working with three- and four-year-old children, moisten the clay more than usual, since they do not have as much strength in their hands. I also don’t introduce the scratch-and-slip method to join pieces of clay to this age. Using very moist clay is usually enough to hold the pieces together if the clay is dried slowly. 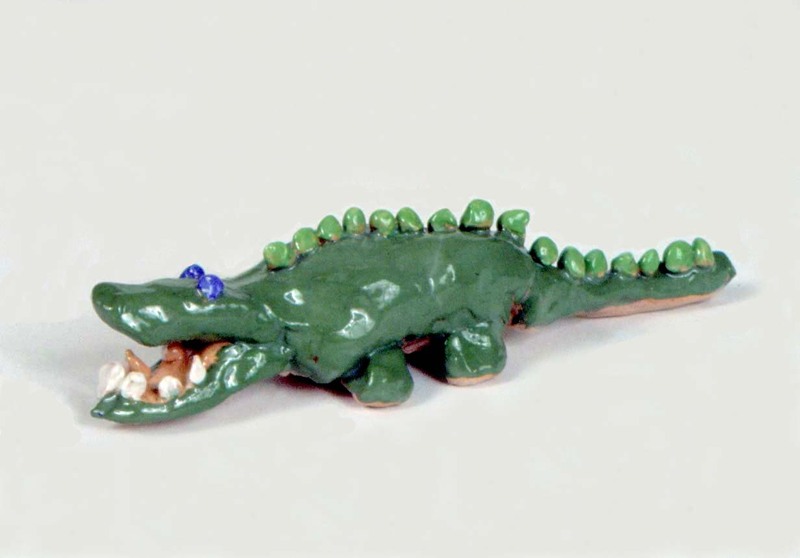 Some children will still work with their clay in a two-dimensional “cookie cutter” fashion. If this happens, lift their flattened clay from the table and turn it around so they can see how thin it is from the side view. For small projects, water works as well as slip and is not as messy. Emphasize that only a dab of water is needed, otherwise the clay will become too wet. Keep reminding the children how easily bisque-fired clay can be broken. If too much underglaze is put on bisque-ware it tends to chip off after being fired in the kiln. Be careful that no more than two to three coats are applied. Are the animals sturdy and able to stand without support? Discuss the individual characteristics of each animal that help to identify it. My animal keeps falling over. I want to make a bird. The neck of my giraffe keeps falling over. I was putting the head on my elephant and he got squashed. I made a very fat elephant! Since wet clay is soft, it is important that your make the animal’s legs sturdy enough to hold the weight of the body. A bird’s legs are very thin and will break easily. Perhaps you could make the bird sitting down. We can support the giraffe’s long neck with an extra lump of clay or a box until the clay hardens a little. Remember that wet clay is soft and you must push gently when you make your additions. You can try to squeeze your elephants legs back into shape or attach new ones. When clay pieces are very thick, I will put an air hole in the bottom to keep them from breaking in the kiln. The hole will not show when your animal is standing up.